Gorgeous of course – especially in fall. 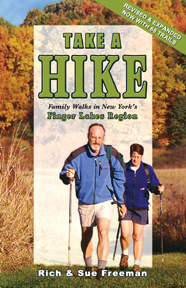 Go see for yourself using the guidebooks Take A Hike – Family Walks in New York’s Finger Lakes Region and 200 Waterfalls in Central & Western New York. One of the most exceptional places to visit, particularly during October, when the trees are ablaze with color, is Sapsucker Woods. 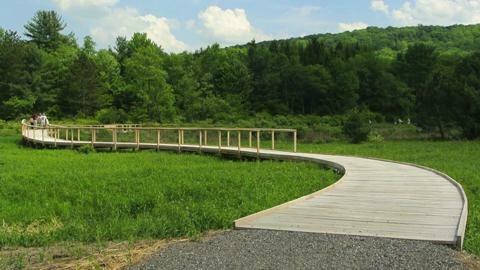 Located within a 10-minute drive of Ithaca, N.Y., it is a Mecca for bird enthusiasts. Each year, 55,000 visitors journey to this facility. Sapsucker Woods is also home to Cornell University’s Lab of Ornithology. “The Cornell Lab is a nonprofit, member-supported organization whose mission is to interpret and conserve the earth’s biological diversity through research, education and citizen science focused on birds,” commented Miyoko Chu, Director of Communications. “You can hear the drum of a Pileated woodpecker, watch an osprey perched on a tree snag and stroll in a mature forest where the voices of a hundred species of birds animate your walk,” said public outreach associate, Charles Eldermire. “Sapsucker Woods is a mosaic of wetlands and forest that attracts a diverse assemblage of birds and other animals. As trees die, they are left standing, which creates habitat valuable for cavity-nesting birds like woodpeckers, chickadees and nuthatches,” Eldermire adds. This is only a taste of what awaits the traveler. “In the observatory, visitors may relax on one of the many chairs arrayed in front of the 30-foot wall of windows to look out over the pond, watch avian visitors to the Treman Bird Feeding Garden and use spotting scopes set up nearby,” staff writer Pat Leonard said. Even the bird song heard by observers is live because of outdoor microphones strategically placed. Visitors browse at the vast array of bird exhibits. One such encased display shows the hummingbirds of the world. “Wildlife artwork adorns the walls. A reconstructed study features bird murals by renown painter Louis Agassiz Fuertes.,” Leonard said. Founded in 1954, the location of Sapsucker Woods was well known to researchers as well as the general public. “The birds and plants of this hilltop woodlot near the lake seemed to resemble the forests of the Adirondacks much more than other woodlots near Cornell…With the help of donors and local landowners, this regionally-important habitat was formally conserved as the Sapsucker Woods Sanctuary, becoming home to the then ‘fledgling’ Cornell Lab of Ornithology,” Eldermire said. Today, Cornell University’s Lab of Ornithology, is a world leader in bird research and conservation. More than 250 scientists, including students and staff, strive to make important discoveries in bird conservation. “In the field and in the laboratory, scientists track and analyze bird diseases,” Chu explained. “Conservation scientists produce land managers’ guides aimed at conserving dwindling populations of scarlet tanagers, wood thrushes and other forest birds,” Leonard noted. Researchers are also working with organizations and government agencies to learn how the use of wind power is impacting birds and bats. “Researchers sequence DNA from living birds or specimens to discover fascinating information about the relationships among species and their lifestyles,” Leonard continued. The ongoing research and scientific studies is not limited to professionals either. “More than 100,000 people participate in the Cornell lab’s citizen-science projects. These projects are enjoyable for participants and they help collect widespread information that scientists need to understand the movement, distribution and changes in bird numbers through time,” Chu said. Another popular program is eBird, an online program that participants can not only keep track of their own bird lists, but can access information from others. “eBird takes in an average of one million bird observations per month,” Leonard emphasized. Another fascinating statistic is that 500,000 visitors a month check out the “All About Birds” Web site. The research and citizen-based projects are practically endless. And to think, this all started with a little parcel of ground from donors and local landowners more than 50 years ago. Here’s a wonderful pictorial tour of some Ithaca area waterfalls. Anyone who wants to go explore these and other Ithaca area waterfalls would do well to pick up a copy of “200 Waterfalls in Central & Western New York – A Finders. Guide.” It’s loaded with maps & directions to lots of gorgeous waterfalls. Another option for finding less expensive backpacking gear is to visit the used gear / consignment shop called Old Goat Gear Exchange in Ithaca NY. According to the Center for Disease Control, New York has long been the national capital of Lyme disease. But for many years the only cases diagnosed locally came when a pet was infected elsewhere and traveled here. Judging by the reaction I received from recently published warnings of above-average infestations of disease-bearing ticks this year, most folks still think Lyme disease is not a local problem. They are definitely mistaken. There have been, over the last five years or so, an increasing number of cases where Lyme disease was diagnosed locally and determined to have been contacted locally. Yup, right here in River (or Lake) City. An informal group of local veterinarians have been tracking the disease and warning patients and anyone else who’ll listen. The data is not formally quantified because there is currently no full-proof diagnostic tool for Lyme and not everyone locally tests regularly for it, anyhow. But the aforementioned group of concerned doctors does test regularly. Doctor William Wilhelm, who lives in Tioga County and runs the Endicott Animal Hospital in Broome County, says the group has found alarming numbers of positive cases – as high as 10 percent of dogs tested proved to be positive in some offices. The word should be out. This is the prime season for tick infestation and its subsequent infections. Check yourself and your pets and have your vet check them regularly. Ticks are most active at this time of year because they are in their nymph stage and their small size allows them to hook on and feed unnoticed for a longer period of time. The Tick-Borne Disease Alliance suggests wearing a hat, long sleeves and avoiding shorts and tucking shirt tails into pants and pant legs into boots when spending time outdoors to reduce the amount of skin exposed to ticks. Ticks are easier to spot on light-colored clothing. It also suggests treating clothing with Permethrin, an insecticide that repels and kills ticks. An EPA-approved insect repellent should be applied to exposed skin, and stay in the center of woodland trails while avoiding deer paths altogether. Again, check for ticks on you and/or your pets as soon as you get indoors and don’t delay showering. Bathing as soon as possible will help remove unattached ticks. Remove your clothes and put them in the dryer at high heat for about 30 minutes to kill any ticks. In 2001 Rick Manning had a vision: a trail that would connect all the main attractions along the shore of Cayuga Lake. Now, almost eleven years later, his vision is close to fruition. If all goes according to plan, all six miles of the Cayuga Waterfront Trail will be completed and open to the public by this time next year. Unfortunately, it will still be a little while before McPheeters can experience her day in the sun. Although money has been the biggest reason for the length of the project, the “right of way” obstacle has come into play just as Manning suspected it would. The trail project was organized in three phases. The first phase was centered on a two-mile trail loop around Cass Park and was completed in 2003. Trail furnishings and trail features, including the trailhead, the inlet overlook and the Miller Grove, were funded with private contributions that allowed for the development of many distinctive spaces and amenities along the trail. That dimension, however, won’t come into the picture until the last and central portion of the trail – phase 2 – is completed. This last piece of the waterfront trail puzzle will connect the Cass Park Trail (Phase 1) to Inlet Island, Ithaca’s West End, Cornell and Ithaca College boathouses, and the farmers market. It will include construction of a trail bridge, two trailheads, trail furnishings, amenities, interpretive signage, and numerous other trail features. It is, however, the only phase of the trail that does not sit on city property. The fact that the boathouses of both Cornell University and Ithaca College are part of Phase 2 is making for complicating trail making. “It required a lot of patience, a lot of listening,” said McPheeters. But they were patient. And they did listen. So now what? Now, it starts to get fun. One of the most exciting aspects for Manning when designing the logistics of the trail was connecting all of the main attractions along the waterfront like they have never been before. From Cass Park, to Ithaca Children’s Garden, to the Ithaca Farmers Market, all the way to Stewart Park – not mention stops in between –Manning knew there was immense potential for Ithaca residents and visitors to experience the waterfront in a connected way through the trail. To make things even more appealing, some of these attractions are doing their own facelifts in an effort to make the waterfront trail worth the walk. Stewart Park is hoping for more than a facelift, however. If Scott Wiggins has anything to say about it, the historic site will get a complete makeover. Projects for Stewart Park include renovations of the Cascadilla Boathouse and the installation of a $250,000 to $400,000 playground. There is also a movement called Ithaca Motion Picture Project, which is a not-for-profit organization whose mission is the rehabilitation of one of the park pavilions. In the early 20th century it was the Wharton Studio building, where over 100 silent films were directed and produced by filmmaking brothers Theodore and Leopold Wharton. These, along with other fixtures in the park, will not only make the park a great place for new faces, but also a nostalgic place for older ones.